It's never easy to chase away the last guests at a party. The job's even trickier when the stragglers number in the thousands. But that's been the task for the U.S. Army Corps of Engineers and a team of biologists at a sandy, desolate, manmade island near the mouth of the Columbia River. Now, nature may be doing its part, too. For years, 230-acre Rice Island between Oregon and Washington has hosted the world's largest colony of Caspian terns, red-billed seabirds with a yen for shrill squawking and nesting in barren sand. The terns — at least in such large numbers — are relatively new to the estuary where the Columbia meets the Pacific Ocean. The population at Rice Island ballooned from zero to 16,192 (1999 census figures) since terns started breeding there in 1986. The most requested item on the terns' menu are young salmon passing through the estuary on their way to the Pacific. With a dozen Columbia River salmon and steelhead runs protected under the federal Endangered Species Act, fisheries managers were alarmed to learn that the terns were gobbling juvenile salmon at an alarming rate. In 1998, the terns ate an estimated 10.2 million salmon. Last year, the number climbed to 11.7 million. It quickly became clear that it was time to find a new home for the birds. The Corp of Engineers, which built Rice Island in the 1960s from river dredge spoils, joined forces with wildlife managers to launch a plan to relocate the terns to East Sand Island about 15 miles closer to the mouth of the river and farther from the path of migrating salmon. Over the past few years, crews have implemented a few passive measures to relocate the birds. They placed decoys and played recorded tern calls at East Sand Island and put up fencing and eagle silhouettes on Rice Island to deter them from nesting. When the terns arrived this spring for their annual April-to-August stint in the estuary, government officials hoped more aggressive harassment would drive the birds to their new home. But the project was grounded after bird supporters sued over the plan and received a favorable opinion from a federal judge in Seattle. "We had to completely back off Rice Island," said Matt Rabe of the Corps of Engineers' district office in Portland. Researchers continued to track the terns this summer and came up with some surprising findings: Terns in the estuary ate about one-third fewer salmon this year than last, and virtually all of them had relocated to East Sand Island on their own. "These are preliminary estimates, but we feel they're pretty reliable," said Ken Collis, founder of Real Time Research, a private consulting firm working with researchers on tern relocation. 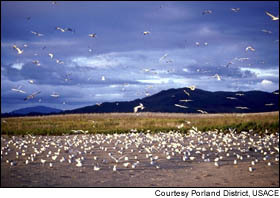 The move to East Sand Island varied the terns' diet to include fewer salmon and more smelt, herring and anchovies. 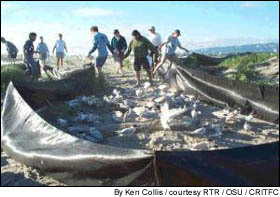 Collis and others on the project say that about 7.3 million salmon were eaten by terns, a 37 percent reduction from 1999. Had the birds stayed at Rice Island this year, they would have eaten about 13.3 million salmon, according to Collis. 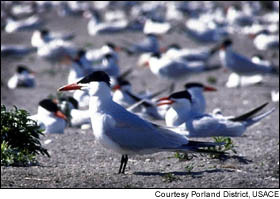 Over the summer, thousands of pairs of nesting terns moved from Rice Island to East Sand Island. Collis said the difference this year is that a core group of terns that had nested on East Sand last year set up shop at East Sand Island in the early spring and eventually convinced the others to join them. "They showed they could breed successfully there," Collis said. About 580 breeding pairs, or 1,160 terns, nested on Rice Island this year. The terns have since left the estuary and migrated south to Central and South America and along the Pacific Coast of Mexico for the winter. When they return next spring, officials hope to have a new plan in place for them. The program for 2001 is to set up several "experimental colonies" outside the Columbia estuary, perhaps along the Washington coastline. A proposal to move the tern colony to Grays Harbor, Washington, earlier this year was thwarted by a powerful state senator who feared the relocation would transfer problems from the mouth of the Columbia to Grays Harbor. Collis said wildlife managers are trying to change that perception — and the vilification terns have received in the contentious battle over endangered salmon in the Pacific Northwest. Spreading out the birds along the coastline would not only protect young salmon from being eaten, but also ensure that the entire tern colony won't be wiped out in a catastrophic event. "If that happens," Collis said, "then you lose three-quarters of your Pacific Coast population."